For many authors, one of the biggest challenges of writing is finding an audience. Both debut novelists and seasoned writers wonder: How many people will buy my book? Who will read it? And who will come back wanting to read the next one? Writers take a big leap of faith when they put a book out into the world. CJ Lyons is one of the lucky—and talented—ones. She is a former pediatric doctor turned award-winning crime novelist whose readership shows a level of dedication and admiration that is unheard of to most writers. Her first series, the award winning Angels of Mercy, was published to great success, earning countless accolades and drawing a hungry crowd of readers ready for more. “I never thought I’d share my writing with the public. I never even dreamed of it being a career,” says CJ. But she left her medical career almost fifteen years ago to pursue writing full time, due in part to the tragic death of her close friend. “As a pediatric intern, I lost a very close friend, a fellow intern,” she says. He was brutally murdered in his own home. While her friend’s killer was caught and brought to justice, many police departments lack sufficient funds to conduct thorough investigations at crime scenes. In honor of her friend, CJ continues to explore themes of brutality and justice in her novels. With the success of her first book, CJ was eager to give her fans more of what they loved and decided to self-publish her second book, Blind Faith, as an e-book. Her New York City publishers were putting out one book a year, but CJ could easily write more and knew her readers were ready for them. In a brave move, she sent out a monthly newsletter asking readers to buy a copy of Blind Faith. In return, CJ created the Buy a Book, Make a Difference program and offered to donate money to a cause very near to her heart, the Sirchie Forensic Institution, which helps train police officers from around the country. 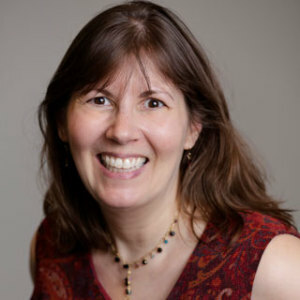 “Despite working for NYC publishers, it was my grassroots efforts to connect with readers that were propelling me up the bestsellers list,” says CJ. 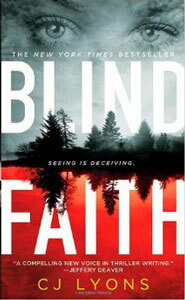 As a result, Blind Faith catapulted to the #2 spot on The New York Times Best Sellers list, landed at #12 on the USA Today list, and won the prestigious International Thriller Award. With this success, CJ decided to continue self-publishing while working alongside her corporate publishers, and to keep her readers involved and engaged through her fundraising efforts. When any of her books reach the Amazon or Barnes & Noble top 100 lists, CJ donates $3,000 to a charity, doubling her donation if the book makes it into the top 20. If her books land on The New York Times or USA Today bestseller lists, she pledges to donate $10,000. While CJ gives her readers ownership over which charity should receive each donation, she still continues to donate to Sirchie, knowing how vital the foundation is to the criminal justice system. Because of CJ’s donations, 70 police departments have received scholarships to Sirchie. “It excites me every time I think of a police officer who has had this training and is able to catch the bad guy who would have otherwise gotten away,” says CJ. All of CJ’s books are set in small towns where resources are limited and crimes often go unsolved for years and years. Having grown up in Pennsylvania’s Rust Belt, CJ calls herself “queen of the Rust Belt thrillers” and gives voice to an often-overlooked area of the country. “These are places where people can literally get away with murder,” she explains. CJ now has 27 books under her belt, half of which she has self-published as e-books, while the other half have been published in print by traditional publishers, selling more than 2 million copies in total. So far, CJ and her readers have donated to St. Jude’s Children’s Hospital, Doctors Without Borders, Reading is Fundamental, and American Heart Association, raising an outstanding $100,000 in total. “When I realized how happy my readers were about having the extra books, I really started to create a relationship with my readers around these e-books. I loved the camaraderie. It felt like it wasn’t about the business, it was about the readers,” CJ says. CJ’s latest donation is for the Veterans Benefit Book Fair, a nonprofit that provides funding and support for veterans and their families. In addition to making a donation to the organization, CJ attended the festival on November 8, 2014, and participated in a panel discussion alongside Deborah Coonts, Patricia Gussin, Iris and Roy Johansen, and D.P. Lyle. And with all the self-publishing options and social media outlets at her disposal, CJ also recognizes that it is a great time to be writer. CJ is continually gaining new readers and touching more lives each day in a way that never would have been possible had she stayed working in the medical field. “If you’re willing to take control of your career, and decide who you partner with and how to best serve your readers, there are so many endless opportunities,” says CJ. Photos courtesy CJ Lyons. 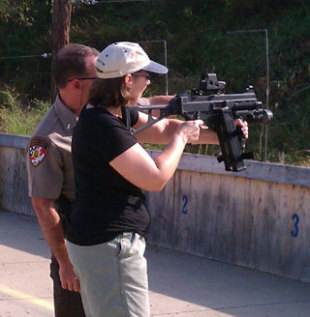 Featured image: CJ takes learning her craft seriously; as a crime novelist, she learns to handle guns. She also takes giving back seriously; her novels help support specialized crime investigative training for police officers.